The integration of customer service into social media marketing programs is a logical imperative and usually will follow right on the heels of integrating corporate communications. The effects of the “new Better Business Bureau” are the ones that are going to strike your organization between the eyes first. How you invite your customer service teams into the medium can spell the difference between harmony and hatred. There was a quote in the comments that said, "Some companies are just not quite ready for true ‘transparency’, and by definition not quite ready for social media." It made me think about this post on the Now is Gone Blog that offers some advice about transparency. Social media brings out the extremes. Go full force and claim social media the savior of all that ails or stick your head in the sand and pretend the world is not changing. A social media effort that is forced or running scared will not be successful. You don’t have to put all your cards on the table. Understand derived value and expectations of your long term social media strategy. Business is still business. The "Seagulls Global Internship International" places college students in rural seaside villages around the world to learn about techniques to prevent seagulls from harassing local villagers while they eat al fresco. The organization recently went through an extensive image/re-branding strategy. As part of that a new logo design was created, changing from a concrete illustration of a seagull to a post modernist abstract version of a seagull. Almost all the college students in the program are on Facebook. The organization has an official Facebook Group and Cause, but many alumni of the program have also started their own groups to express their affiliation with the organization. These groups are not "controlled" or "managed" by the organization. Yesterday, the Internet strategy staff person who supports the Facebook Group visited the student-created groups and found that they have posted a humorous and slightly distasteful remix of the new logo. (Use your imagination) There was also a discussion thread about why the students hate the new logo and an online petition to get signatures to lobby the organization to revert to the old logo. Having just spent a lot of money on a new logo design which is printed on everything from t-shirts to business cards and on the new web site, the Communications staff is not likely to change it. The student group thread and petition did not have a lot of signatures or comments yet. What do you do as the social networking manager? 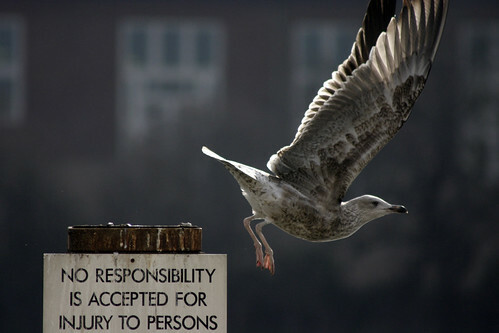 Do you ..
Do what the seagull in the photo above is doing to the complainers? Do you post a response to the Facebook Group telling the students they have no design sense? Do you post a response to the Facebook Group (and elsewhere) explaining the design process, logo, and branding strategy? Do you ignore them - saying don't feed the trolls? What do you tell your colleagues in the communications department and your boss who sort of skeptical of Facebook, but understand that it is a necessary evil given your audience. Now let's say that you discover Sherman and Peabody's Wayback Machine, what you have done differently about the logo creation process? Great post! I address this subject as well: For Nonprofit Organizations: How to Handle Online Criticism; will definitely link this from my own resource (if I can figure out how -- blogs continue to confuse me). Thanks for stopping by and providing a pointer to your resource. Do you have any immediate specific advice in this situation? Heh, (design) wisdom of crowds. Sounds like a Chevvy Tahoe [http://tinyurl.com/yt438q] situation. Put the fonts, pictures etc out there and get the community remixing and mashing up the logo, the identity et al. Make clear that there is no guarantee any will be taken on as the official one but all will be left on the site available as open source, creative commons resources. Sure some may (Tahoe-like) critiques, possibly even against the brand, off message but heh there will (Tahoe-like) whole creative and passionate communities creating new ideas, connections and relationships with the organisation and its issue. What you might end up with is an even better (and cheaper) logo or not. What you will certainly end up with is mass-ownership, real stakeholder engagement. Open source design leading to stakeholder engagement. The basics: Respond with respect and humor. Offer to include them in a new design project. Tell staff to relax. Embrace it! You will never ever please everyone. The best thing you can do is recognize the folks that disagree (that's 90% of what they want anyway - to be heard), and poke a little fun at yourself along the way to show that you don't take yourselves too seriously. I would write a blog post and display all the Safe For Work takes on the logo, explain a little about why we did what we did, and thank those who disagree for caring so much. Hi Beth - as a social change agent this post is thought-provoking, thank you. Here's my take on it. First, take a step back and try to understand what has happened and is happening, and why? Second, listen. Is there an underlying issue besides the logo itself? Third, would an authentic apology and engaged conversation help to surface the best actions and renewed commitment to the goals each holds dear? An example: A few months ago, the Hershey company came out with a new line of Icebreaker mints, packaged like street drugs. For drug-free coalitions and law enforcement all across the country - this was a huge issue. Many letters/emails written and met with the equivalent of the seagull image, until finally enough voices/pressure that Hershey opted to discontinue the product. I thought how sad it came down to a stand off. I'm sure it cost them a lot to discontinue the product and yet how much more it could have cost in terms of customers. While there are many lessons, the one that seems most important here is that its all about engaging people early and often through social media. Great job, Beth! I would respond to the group by starting a conversation about the process of re-branding and explain the steps that the org went through to come to the new logo/branding/etc. Then, as it should be a conversation, ask for feedback on the process (since you already have feedback enough on the result), and how this community of constituents would have liked to be involved in shaping what could have been a different end result. Then, tell the communications team roses and thorns from BOTH conversations, so there is something more constructive to discuss than just, "people don't like the logo!" And instead you have something like, "this community felt that there could have been an opportunity for voting or commenting on a variety of options earlier in the design process and doesn't particularly like the logo we have now -because of these reasons- but thinks a logo -with these attributes- would better fit an organization with a mission like ours." Isn't that an easier pill to swallow even though it's the same issue? I think so! Beth wrote me and ask to actually say what I would do. But as I look through the responses, I think Holly nails exactly what the response should be. It's realistic, it's sincere, it takes everyone into account, but asserts the organization going with its choice (if that is, indeed, what they want to do). At least a few volunteers get alienated by "their" organization when a policy or logo changes -- it happens frequently, just as for-profit businesses may lose some fans when they change a product or phase one out. Such is the nature of both sets of businesses. I laughed though over re-reading "What do you do as the social networking manager?" I've never worked with an organization that had a "social networking manager." Many of the orgs I work with wouldn't know what such is. Another one of those jargon gaps between the tech savvy and a lot of nonprofits. That said, the response should most definitely NOT be just one person's to make; everyone at the organization that has anything to do with the public should participate in brainstorming how to respond and how to proceed. Great response and thanks for the jargon detector ... I drink too much koolaid. But you didn't answer the really big question . did you run into Prince Harry or have you left Afghanstann? Jayne: You're in my reader (along with 999 other blogs) one thing that I do sometimes is mark read - when I'm feeling overwhelmed - it doesn't mean that I don't love you!! Off to catch up on your blog! Great post, Beth. And one of my all-time favorite, spot-on Flickr photos.